So I was going through my photo’s from my trip to Center Parc’s in Elveden a couple of months ago, when I stumbled upon some photo’s of these beauties! Running this blog has turned me into a person who compulsively takes pictures of her food (I know, I know – i’ve turned into one of those people – the one who won’t let anyone eat until they’ve taken pictures of everyone’s plates from three different angles.. sigh) so my phone is often full with pictures of food! When I saw these though I realised I hadn’t written about one of my favourite places to eat! (I remember starting to type it up but what happened after that really is anyone’s guess.. )These are pancakes and omelettes from The Pancake House. Center Parc’s started out as a holiday park based in Holland and since then it’s grown massively, especially here in the UK. As a bit of a throwback to their heritage most (if not all) Center Parcs villages will have a pancake house. 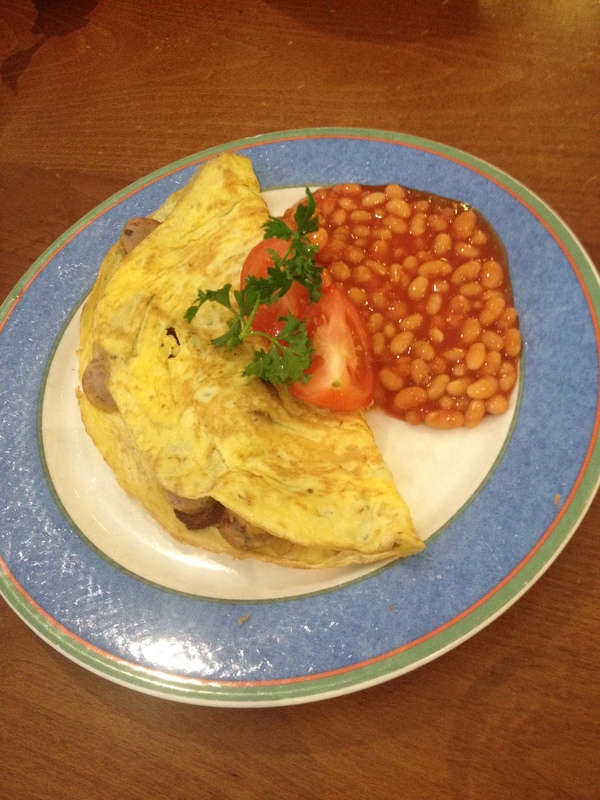 This was an omelette filled with bacon, sausage, egg, mushrooms and tomatoes – served with baked beans. I think you’ll agree it looks pretty tasty! My other sister had a Farmer’s Omelette. 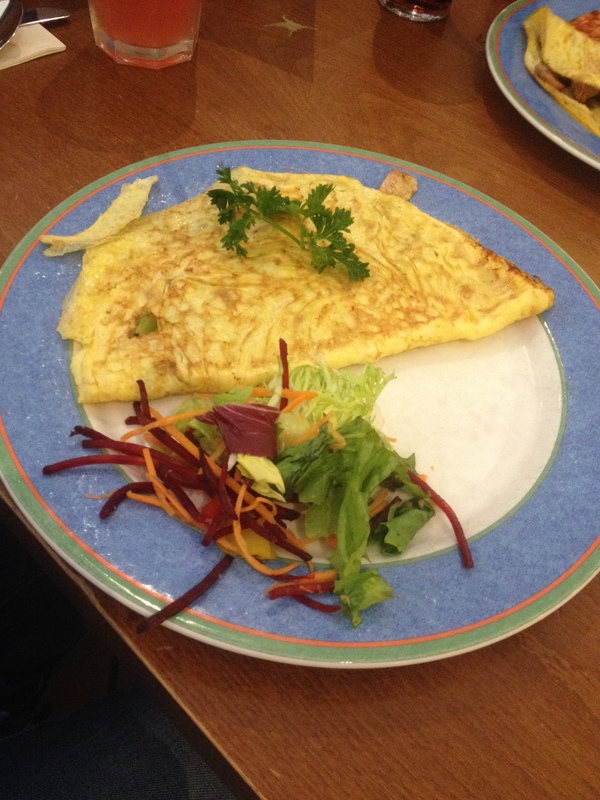 This was filled with mushrooms, peppers, spring onions and cheese – served with a small side salad. My Dad and I both went for a squishy pancake and since we went for the same flavour – we just have the one picture. This is by far my favourite pancake of all time. Something I might not pick now I’m trying to eat more veggie options… But regardless at the time it was delicious and it’s the second or third time I’ve order this flavour. This Pancake is called The Meat Feast and features meatballs, pepperoni, sausage, ham and cheese. I don’t know what kind of cheese they use but when it’s grilled it gets a cripsy texture but keeps this delicious smokey, flavourful taste. It’s a nice contrast to the meat and the squishy pancake. You would think this would still be quite dry (and crying out for some bbq sauce!) but it wasn’t and it was perfect with The Pancake House’s cloudy homemade lemonade. I thoroughly recommend trying out a Pancake House if you’re heading to any of the Center Parcs villages any time soon. If you’re going on either of the change-over days (Monday or Friday) it’s worth booking in advance (last time we waited 40mins for a table, then another 40mins before our order was even taken – can’t complain though because they did warn us and keep us informed!) because I think its fair to say that this is one of Center Parc’s worst kept secrets!